On Wednesday, November 8, administrators from the four high schools of Yap Proper met at Yap Catholic High School to discuss how the high schools can work together to improve the overall educational opportunities offered to the youth of the island. The meeting began with an assertion that the high school administrations should work towards helping each other in order to benefit all of the youth of Yap. The group also agreed to hold a meeting during the summer as well so that the principals of Outer Island High School and Neighboring Island High School can participate as well. The administrators of Yap High School, Faith Christian Academy, Yap SDA School, and Yap Catholic High School were present. Director of Education, Teresa Filepin, also attended the meeting as a sign of support from the Department of Education. During the administrators meeting, YCHS Director Fr. Jack Mattimore, SJ and YCHS Principal Mr. Michael Wiencek gave an overview of the SRA Reading Lab program that will be implemented at all four high schools this year. The program was made possible through an AusAid grant and focuses on developing reading comprehension, vocabulary, and writing skills for students. 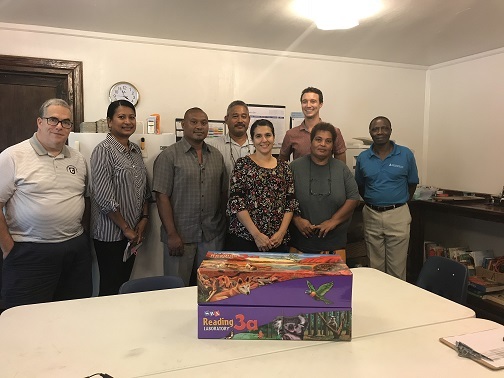 Principal Michael Wiencek also reviewed the plan for upcoming trainings for the Yap Robo League which was recently expanded thanks to the efforts of Habele and the United States Department of the Interior. In early December, the four high schools will send their teacher representatives to YCHS to undergo the necessary training so that the students can begin building their robots in January to be prepared for the island wide Robo Day in May 2018. The meeting concluded with an affirmation that the administrators would work together to communicate effectively in order to offer the best possible opportunities for the students. Upcoming events involving collaboration include: the Varsity Sports League, the Yap State Debate, and the Yap Science Fair hosted by COM-FSM Yap Campus. The high school administrators will meet again during the second semester to continue their collaborative efforts.